Nearly everyone is an excellent candidate for a Roth conversion this year. If you failed to convert money from an IRA to a Roth IRA last year, you missed an opportunity. Don’t make the same mistake this year. You can always undo part or all of a Roth conversion with what’s called a recharacterization, so you can’t convert too much. A Roth conversion can push you into a higher tax bracket. But all tax brackets are rising in 2013 as the Bush tax cuts expire, making the hurdles much lower for this year’s conversion and the likelihood of keeping your Roth conversion much greater. But you won’t know exactly how much to keep and how much to undo until you compute taxes owed and see how adding more income interacts with the complex tax code. A conversion can increase taxes on Social Security. It can also affect the premium you pay for Medicare Part B and can trigger alternative minimum tax (AMT) rules. To preview how to recharacterize a 2012 Roth conversion this time next year, let’s look at the rules for recharacterizing Roth conversions done in 2011. Mr. Typical is 45 and earning $75,000 with a $500,000 IRA rollover from a previous employer. He is at the bottom of the 25% tax bracket and not liable to earn less now or in the future. His 25% bracket will rise to 28% at the end of 2012. He did a Roth conversion using five accounts, each with an initial value of $100,000. Now he has to decide how much taxable income he would like to realize up to a maximum of $575,000. Do I need to make estimated quarterly payments because I’m doing a Roth conversion? You are not required to make quarterly payments to avoid interest and penalties. A safe harbor provision states that if you pay 100% of the taxes you owed last year and your taxable income was under $150,000, you do not need to have paid more throughout the year even if you add a million dollars of Roth conversion. If your income was over $150,000, the safe harbor is 110% of last year’s taxes. The year after a Roth conversion is more difficult. You may not want to pay 110% of last year’s taxes. With some careful tax planning, you are safe so long as you pay more than you actually end up owing before the end of the year. Mr. Typical’s taxable income for 2010 was only his base salary of $75,000. Thus his safe harbor in 2011 was making estimated tax payments to cover 100% of his 2010 tax obligation. When do I need to pay taxes on the Roth conversion? The 2011 federal tax return deadline is April 17, 2012, including paying any tax due. You can file an extension and delay some decisions. But if you have not paid sufficient taxes by April 17, you will owe interest and penalties. Deciding how much Roth conversion you want to keep can be challenging. After Mr. Typical’s base salary of $75,000, he can convert an additional $64,350 and stay in the 25% tax bracket. Because his bracket will rise to 28% in 2013, he should convert this amount so long as the account value hasn’t dropped by more than 10.7%. An additional $72,950 can be converted at 28% this year. He will be in the 28% tax bracket next year anyway, so this conversion has a hurdle of 0%. If this conversion earns any appreciation, Mr. Typical is better off keeping it and paying the tax this year. Thus with any positive appreciation, he will be glad to have converted at least $137,300. This strategy would bring his taxable income to the top of the 28% tax bracket at $212,300. When Mr. Typical started a Roth conversion this was the amount he was guessing he would keep as a conversion and pay tax on. Even if the accounts did not appreciate at all, this decision would still save $1,930 in future taxes. But Mr. Typical segregated his conversion into five different accounts. By now they have all appreciated differently. If two of the accounts have appreciated more than 17.9%, the amount he should keep as a Roth conversion increases to $200,000. His tax savings will be over $9,000. By April 17, Mr. Typical’s five accounts will have appreciated differently. He must decide now how much of his Roth conversion to keep. An account up over 17.9% in April could drop in value by the late filing. Another account could appreciate enough to justify being kept. I would advise Mr. Typical to pay the tax on three accounts to keep his options open while hoping to keep at least two accounts. I might also suggest recharacterizing the two worst performing accounts and reconverting them. Do you need to file a tax return extension when doing a Roth conversion? You do not need to file an extension, but we highly recommend it. Once you have officially filed your taxes, you are required to pay tax on everything you have converted. If you have five accounts but you are only planning on keeping one of them, you can pay tax on one of them before April 17. Then you will wait to see which one you want to keep. The extension deadline for filing your federal tax return is October 15. A lot can happen between April and October. For example, in 2011, accounts that had appreciated nicely in June were down 20% by October. Filing a tax return extension allows you to pick which horse you are betting on as late in the race as possible. Since Mr. Typical is paying tax on all three accounts he is letting ride until October, he could file his tax return in April and then file an amended return if he decides to keep only two of them. How do you execute a Roth recharacterization? Undoing a Roth conversion is as simple as moving the money from your Roth IRA back to a traditional IRA using your custodian’s forms for a Roth recharacterization. 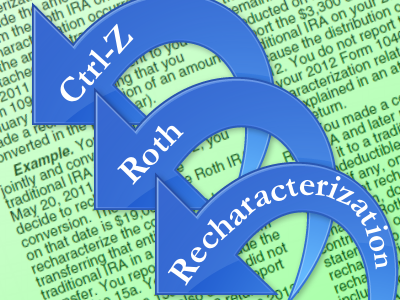 You can also execute a partial recharacterization and move part of the Roth back to a traditional IRA. You can work with your custodian to recharacterize the right percentage of the current account value to realize or keep the right dollar amount of the original conversion. When you recharacterize a Roth IRA back to a traditional IRA, you’ll need to get certain values from your custodian to report the recharacterization correctly on your taxes. Both a Roth conversion and a recharacterization trigger your custodian to report these decisions on Form 1099-R. The gain or loss on the portion recharacterized allows the IRS to follow how much of the original conversion amount was recharacterized. Complete instructions are found on Form 8606 at irs.gov. When can you do a new Roth conversion after a recharacterization? You can’t convert the same money twice in one year. Since Mr. Typical initiated his conversion during 2011, he can reconvert funds in his IRA in 2012 but must wait 31 days after the 2011 recharacterization is executed. If he had $1 million in his traditional IRA, he could have opened an additional five accounts for 2012 without needing to recharacterize and convert the money again from 2011. What needs to be done before October 15? Any Roth conversion accounts you want to unconvert must be recharacterized before the late filing deadline. Mr. Typical’s accounts may have flip-flopped. A different account might be worth recharacterizing because it dropped in value. Keeping Roth conversions segregated in separate accounts allows this flexibility. Because of the increase in tax rates in 2013, I would be quick to recharacterize 2011 Roth conversions and try again in 2012. For a 2012 conversion this time next year, I would want to keep the conversion knowing that if I redo the conversion it would be under the higher rates. This is the last year that tax rates suggest executing a massive Roth conversion might produce large future tax savings. Don’t miss this chance. Please tell Mr. Marotta that I’m glad to have rediscovered his website ! derivative of “ex to the x” is……………simply “e to the x” ! He plays chess too ! Is he a USCF member? The number e is related to powers, hence used it all power law mathematics. Read about The Number e in Wikipedia. I used to play tournament chess, but found investing both slower and more lucrative. In chess there is only one winner while in investing real productivity means all can win.